This band from Chile is one of the most interesting blends of folk and symphonic rock. The band featured Claudio Parra, Gabriel Parra, Gato Alquinta, Eduardo Parra and Mario Mutis (this line-up is from the LP "Cancion Del Sur"), they are playing many instruments including the ethnic tutruka, charanjo, tarka, tumbadore, bongo and maracas. In ’73 the legal government was overthrown very bloody by a new, ‘CIA sponsored’ militarian dictatorship and Los JAIVAS had to flight. They first went to Argentina and then to France. In the Seventies en Eighties Los JAIVAS made a serie of LP’s, recorded in all aforementioned countries. They gradually incorporated more progressive elements into their rock and folk based sound. Eventually Los JAIVAS developped a very unique sound that is hard to compare with known progrock bands. Perhaps you could say "Los Incas meet Mike OLDFIELD”? On their own site I read that Los JAIVAS released the live-CD "Los Jaivas: en vivo Chile" ’88 and in ’97 they made a record with many friends (like the band Congreso) entitled "Trilogia: El Reencuentro". In general the album "Cancion Del Sur" from ’77 is considered as a great effort. 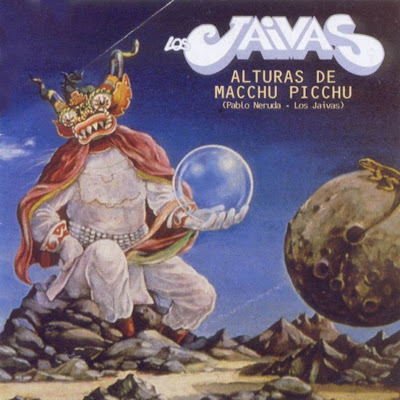 It sounds very progressive (native South-American instruments and flute along electric guitar and synthesizers) but I prefer the more mature and symphonic album "Alturas de Machu Picchu" from ’81, featuring Nobel prize winning poet Pablo Neruda, responsible for the lyrics. Highlight is "La Poderosa Muerte", a melodic and harmonic composition (around 12 minutes) that starts with the typical sound of the panflute and melancholic piano notes, very beautiful and moving, followed by emotional Spanish vocals. The build up is magnificent with propulsive drums and sparkling piano play, soon accompanied by a fat sounding synthesizer and fiery electric guitar. The dramatic atmosphere is emphasized by pathetic vocal harmonies. The moods keep on shifting with lots of (ethnic) instruments, a very emotional experience and a fine proove that progrock has emotion!